buybypost has no other items for sale. 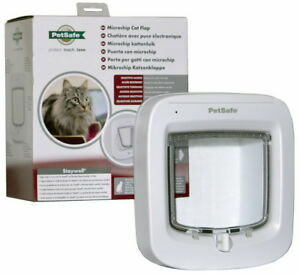 Details about Petsafe Staywell Microchip Cat Flap White Easy to Program Door with 4 way lock. By clicking the buy button you agree to these terms and conditions. By completing and submitting the electronic order form (or proceeding through the 'checkout process') you are making an offer to purchase goods which, if accepted by us, will result in a binding contract. Neither submitting an electronic order form or completing the checkout process and payment constitutes our acceptance of your order. Delivery destinations. It is not always possible to delivery to some destinations we with hold the right to cancel orders that are not cost effective to deliver or where restricted goods laws prevent us from making delivery. © Copyright 1994-2014, Master Plastics (SW) Ltd all rights reserved worldwide. Many of the images on this site do not belong to us do not copy or link directly to them. Contact us so we can seek permission where necessary on your behalf. VERY fast delivery. Many thanks. Not fitted yet as needed for new home.